Sometimes taking a wrong turn ends up being the right turn. Since I've started this taco hunt I have been taking different routes home from work hoping to find taquerias and taco trucks I wouldn't normally know about. Not only has this allowed me to come across new taco establishments it's also brought a bit of serenity to my life. I'm no longer the guy that curses out other drivers on the 10 freeway. And this is how I came across Taqueria Jalisco on Washington Blvd(3 blocks east of La brea). 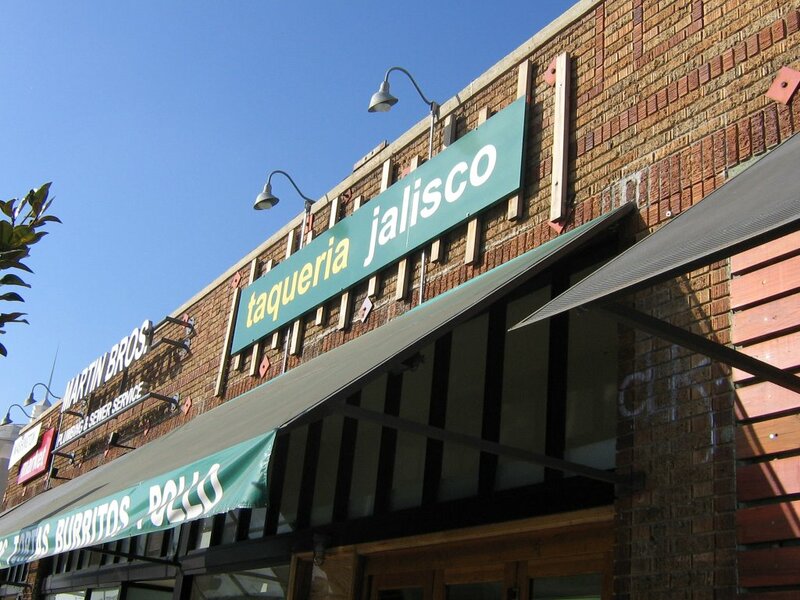 This taqueria has a full menu of mexican fare as well as tacos and burritos. 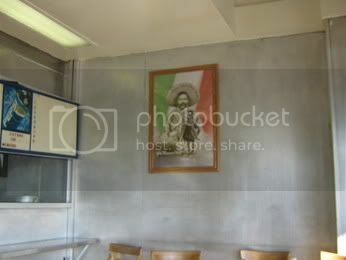 There's no bulls head mounted on the wall but there is a portriat of Pancho Villa which ranks a close second in intimidation factor. 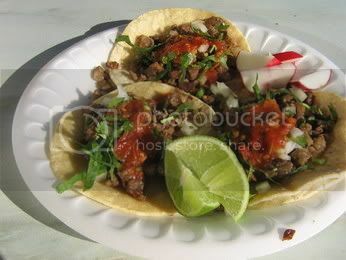 I ordered 3 asada tacos.Each taco came with onions, cilantro and a mild picante salsa that was quite tasty. I'm partial to that spicy salsa roja that makes me reach for a jarritos but this picante salsa had some nice flavor to it. As far as the rest of the taco the tortillas were oiled just right and firm and the beef was salted and tasty but a bit on the fatty side. There was a bit too much gristle and the trust I like to have with a taco was broken and I found myself plucking out fatty bits before sending the taco to my mouth for consumption. In the end the tacos didn't overwhelm me but they did quench my taco thirst for the time being and I will try Taqueria Jalisco again to see if this gristle experience was an oddity or if it's a common occurrence. I just left you a rather stalkeresque comment on your Rincon review... whoops! I don't know if you've reviewed the following two taquerias, but I highly suggest a trip to siete mares in Lincoln Heights and also Rico's Don Chuy at 6913 Pacific Boulevard in Huntington Park. Rico's is small and not super clean, but the carne asada tacos are pretty great. I always thought it would be a great idea to do nothing but review taco places. I heart tacos. 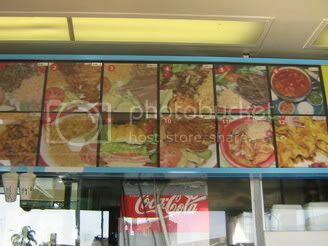 is the siete mares in lincoln heights the same as the siete mares on sunset blvd? I went to the sunset location yesterday. I'll add Rico's Don Chuy to my little black taco book. hey bandini, i checked out el matador and cactus at your recommendations. whoa the salsa at cactus is spicier than king taco! anyhow, thanks, those were great. and i asked - both la estrella's are the same owner, but the tacos are a lil diff, imo. cheers for now! Yes, the siete mares I was talking about is the one on sunset... haven't been to that restaurant (or Don Chuy's) in over a year, I hope both are still good! These days I either stick to King Taco, since it's close to where I work, or the valley haunts. I am checking out a Taurino in downtown next week with some coworkers... it's on Hoover & 11th. Will report back heh heh. This is the best kind of investigative journalism!! yeah that cactus salsa roja has some kick to it. Same goes for their habanero salsa. Did you go there at night? 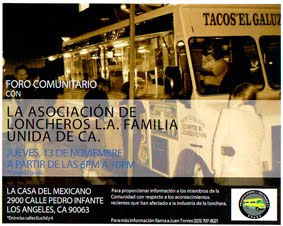 they roll out their salsa cart at night and I think it may be the best taqueria salsa cart out there. It reminds me alot of King Taco. Especially the salsa. I love Taqueria Jalisco!!! The tacos are okay BUT their chicken dinner and fish dinner are to die for. The meat is juicy and it comes with beans, rice, salad, avocado and tortillas on the side. It's something like 6 or 7 bucks for this huge, delicious dinner portion. My sister and I usually share a plate and order extra tortillas.